Dermal fillers are a non-surgical option to restore or augment facial volume, thereby enhancing one’s natural beauty through facial profile balancing. This can result in a more youthful and rejuvenated appearance. As we age, we lose volume secondary to bone, muscle, and fat loss; and collagen and hyaluronic acid production also slows. Mechanism: Hyaluronic acid fillers are a gel-like substance which add volume giving a more hydrated and plump appearance. 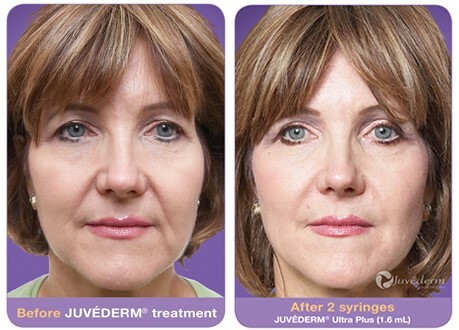 Actual patient, before and after Filler for Nasolabial Folds. 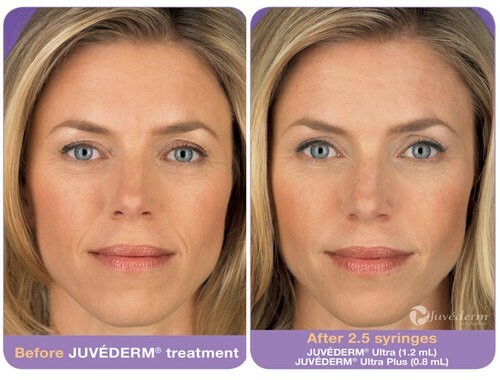 Image credit Allergan. Actual patient, before and after Lip Filler. Image credit Restylane.